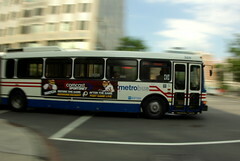 Metrobus to Do Things By The Book? I know this makes me nerdy, but I love that scene in Wrath of Khan where Saavik and Spock start talking about doing things By The Book, and the post this morning from Unsuck DC Metro is reminiscent of that this morning. One of their readers announced a few changes on his 52 bus last night, suggesting that folks may need to allow for additional time due to drivers following regulations to the letter in order to better reduce casualties in the bus system. It’s not clear if this is an organized union-endorsed behavior, or if this could be considered like a work stoppage. So, did your bus seems slower than usual this morning? Or, was it business as usual? And yeah, you can totally call me a nerd for referencing Star Trek in a post about Metrobuses. Because I deserve it. This entry was posted in: Talkin' Transit, The Daily Feed, WMATA, WTF?! Tom, that’s an excellent reference. But let’s just hope we don’t lose Leonard Nimoy because of this…whatever it is. Yesterday my usually too slow commute got even slower because the bus driver was not willing to pass other buses on the left hand side. As the S9 is an express bus I’m not sure what sense it makes to sit behind the regular city bus all the way in DC from Silver Spring. So every 5 minutes for 45 minutes she shouted to the passengers that she would not be going around the S2 which has 3 times as many stops to make. Great.